Sage is the best herbs for sore throats. It’s also good for memory retention. I have not found direct reference in Islamic medicine books to the herb sage. 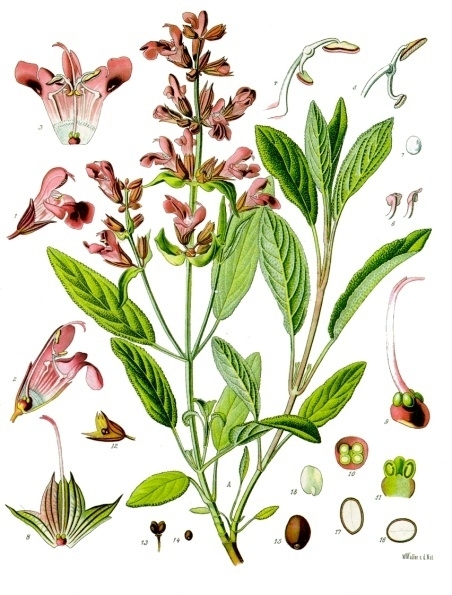 However the herb sage in Arabic is called mariyama and I know it is used in the Arabic world. I believe that there are books with this information that have remained untranslated into English, is it any wonder where too many of us are still eating white flour and white sugar. As an ex-Rasta I came to Islam with a little bit of knowledge of herbal medicine, having read books like, ”Back to Eden ” by Jethro Kloss, a Quaker herbalist and put what I learnt into practice. Sage is well known as the best herb for sore throats, it’s a stimulant however, so I wouldn’t drink it before bed. It’s one of nature’s top antioxidant herbs, that means anti-aging. Sage is an outstanding memory enhancer, so for those of us who are studying, which should be all of us, this herbs is a great help, alhamduliah, praise The Creator. So if you have sore throat right now, please read on. You can buy the dried herbs in most places and have as tea with honey. The ratio for concoction is 1 teaspoon with 1 cup of hot water, leave 5 minutes , strain and pour into cup, add honey. Let the kettle boil then let the water calm down and cool a bit before adding to the herbs fresh or dry it all good. You can make a larger quantity and leave to go cold and strain and place in bottle to gargle for a sore throat.